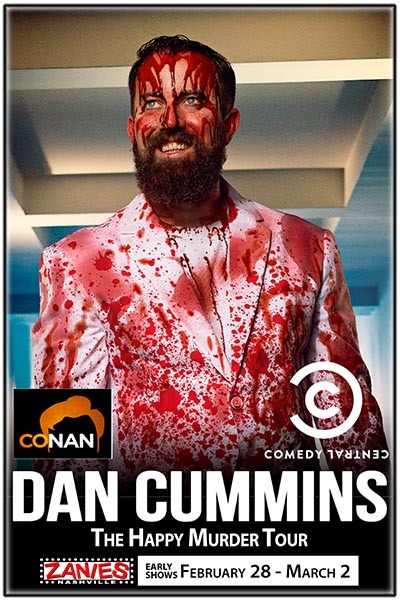 Dan Cummins has been a guest on multiple Late Night shows, from CONAN to the TONIGHT SHOW to THIS IS NOT HAPPENING. He’s had a Comedy Central 1/2 hour special, a one hour Comedy Central special, CRAZY WITH A CAPITAL F, and most recently, Amazon’s DON’T WAKE THE BEAR. Dan’s enormous fan base on Pandora is part of what makes him stand out. Over 300,000 fans have created stations solely based on Dan Cummins comedy, pushing his plays to over 306 million. He ranks as one of the most “liked” comics on Pandora with an average of over 80% thumbs up. Dan’s never-ending quest for knowledge has led him into the sometimes dark but always interesting and hilarious world of TIMESUCK. This weekly podcast, released every Monday at 12 PST, is a slightly irreverent but consistently entertaining way for the eternal knowledge seeker to get their dose of thoroughly researched information. From Scientology to Jeffrey Dahmer to the KKK, no topic is off limits. Dan’s growing community of savvy listeners download almost 1 million episodes a month, proving that Dan isn’t alone in his love of learning in a new and exciting way. Timesuck can frequently be found in iTunes list of the top 100 most downloaded comedy podcasts. Dan’s been a guest on other popular podcasts like BERTCAST, The Adam Corolla Show, The Church of What’s Happening Now with Joey Diaz and various Barstool Sports shows amongst many other podcasts. Remaining true to his love for writing and his passion to make people laugh, Dan stepped out on his own after recording five previous albums with Warner Brothers Records, to record not one, but two new albums in 2018. Maybe I’m The Problem was exclusively available in its entirety on Pandora for several months before its national release where it went straight number #1. Maybe I’m The Problem remained in the top 10 for several weeks after its release. Dan, always taking care of his most loyal fans, released the second album, Feel The Heat, to only his most loyal Timesuck fans via Patreon where he has over 2,500 monthly subscribers. Currently Dan is building material for an 8th album/special on his 2018 “Flat Earth Tour”, selling out rooms around the country.